The postmodern workplace is in an eternal state of flux, much like the technology, and the economy that shape it. And the majority of the workforce in this milieu are millennials, who also embody the same attributes. As this millennial workplace grows, acquiring new values and visions, retaining employees and reducing turnover requires the thoughtful and deft integration of process and technology. When it comes to HR, which is all about people and process, employee on-boarding and training are two critical areas that can address issues pertaining to retention and turnover. According to Gallup, millennial turnover alone costs $30.5 billion annually. When employees undergo a structured onboarding process, they have greater trust in the organization. Research shows that employers who invest in a proper onboarding process reap return in terms of increased productivity. With an automated human resource management system, onboarding tasks such as identity verification, and provision of equipment, ID cards, and access to software systems become a breeze. Dissemination of workplace policies can be centralized by storing digital documents in one location. Automation also enables tracking and visibility into various requests and processes, for both the employer and the employee. 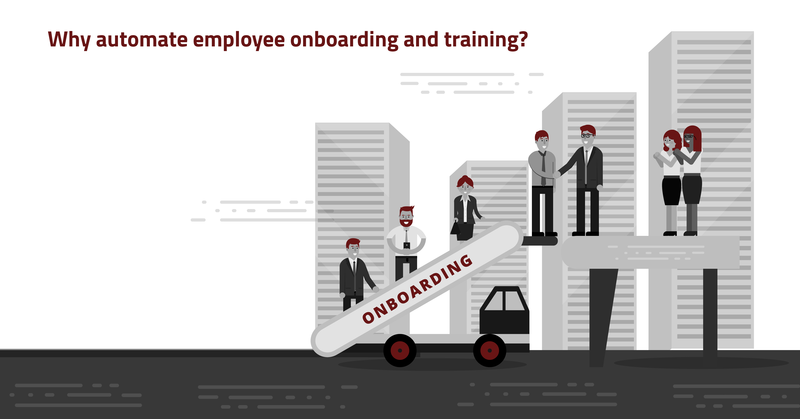 Training is one of the most time-consuming components of employee on-boarding. When employees are set up with customized training modules specific to their role from the start, they are more likely to succeed in their work. The advent of new paradigms of learning such as microlearning has further blurred the lines between learning, doing, and being in the modern workplace. With AI and automation, you can now deliver a curriculum tailored to the needs and interests of both, the business and the employee. An automated HR management software helps you collect vital feedback by periodically checking-in with new hires throughout their onboarding and training. Data from surveys and chatbot conversations can help unearth insights into your process workflows. However, you will need to choose the right metrics to make this exercise work well for you. Most importantly, putting thought and care into your on-boarding and training will boost employee morale. And technology can help you get there. Smart HR management software solutions that seamlessly integrate HR functions such as workforce management, employee self-service, and payroll, help streamline your operations, freeing up resources for key business specific functions.